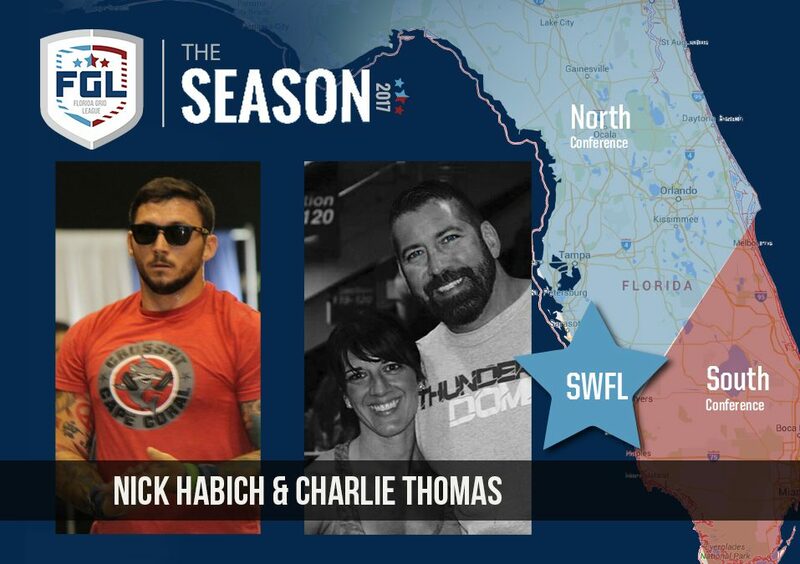 The Florida Grid League’s 5th announced team of the 2017 FGL Season team hails from South West Florida (SWFL) and has been acquired by a GRID 6 competitor in Charlie Thomas, and prominent SWFL gym (CrossFit Cape Coral) co-owner Nick Habich. The FGL Season will consist of GRID teams representing cities in Florida competing in a regular Season, Playoffs, and Championship for a $20k Grand Prize. Learn more about the FGL Season here. The SWFL team joins the Tampa Bay Brigade and newly announced Orlando in the Northern Conference and the Miami Freaks and Palm Beach Elite in the Southern Conference. They will soon be announcing their name and branding. We see this as an opportunity to strengthen and support the community of our gym and the SWFL fitness community in general. Not only that, it will create opportunity for a wide variety of high performing athletes, around here, that work as hard as any big name athlete, but are limited in CF by certain aspects of fitness. Plus, the sport is awesome and it will be fun! The two have been friends for years and will act as the primary leadership of the organization. Nick will take on the GM and Head Coach role in year 1. Nick is an Athletic Trainer, Massage Therapist, and Certified Strength and Conditioning Specialist. He is a dedicated athlete who regularly competes (with varying levels of mediocrity) in local 5ks, Crossfit, and Olympic Weightlifting competitions. He is also the Co-Owner of Crossfit Cape Coral, and has been coaching functional fitness style classes for over 3 years. He has trained athletes to pass military, firefighting, and police academies, as well as College Division I athletes during offseason. He is an 8 year US Army Veteran. Charlie is a former collegiate football player. He regularly exercises and competes in varying levels of fitness, including JiuJitsu and Crossfit. He owned a successful floor contracting business for over 10 years. He is currently a multi licensed insurance agent at Sullivan State Farm in Cape Coral. He is married to a beautiful wife, who is a competitive crossfit-style athlete, and has two beautiful daughters. If you are interested in playing for, or working with the SWFL team, the FGL Season, or to find out what other team markets are available, learn more here or email info@thefgl.com.